Brick Pollitt risked being pegged as weak and less than a man when he ventured into territory that was unexplored at the time – the heart of a man. A dysfunctional family before dysfunctional was a word, greed and avarice, alcoholism and “clicks,” smoldering but repressed sexuality, latent homosexuality – and lots and lots of mendacity. All those things and more are the ties that bind the Pollitt family in the 1958 film version of playwright Tennessee Williams’ smoldering stage play “Cat on a Hot Tin Roof.” Who would care today if Brick and pro football buddy Skipper had a bromance going, and would anyone blame Maggie the Cat if she jumped off the sizzling hot tin roof and into the bed of her husband’s gridiron hero? Tame stuff by contemporary mores, but steamy and scandalous material for a conservative and sedate 1950’s America. 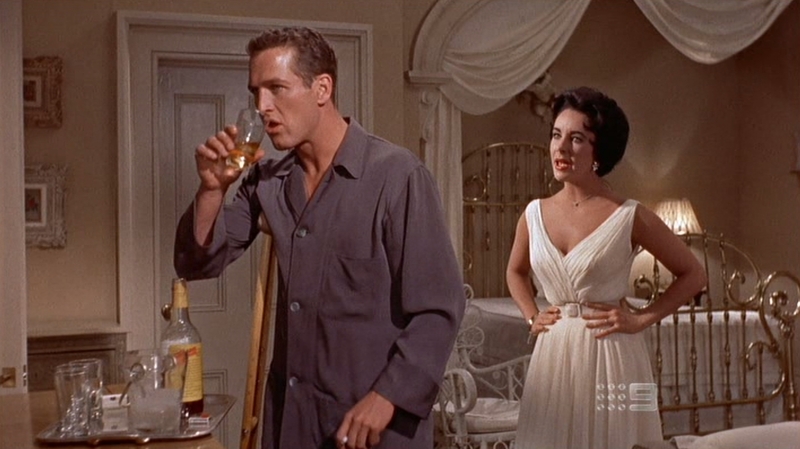 Nonetheless, “Cat on a Hot Tin Roof” was a critical success with nary a bad review and, produced on an estimated budget of $3 million, hauled in a box office of more than $17 million domestically and $25 million worldwide – the equivalent today of nearly $140.5 million and more than $206.6 million, respectively. Yet an underlying commentary of the film went ignored by movie critics at the time if it was even considered at all, perhaps as taboo or too risky, namely the challenge to the social definition of masculinity and what was – and wasn’t – expected of a man. That commentary, ignored and not considered in 1958, remains as pertinent today as it did then, nearly 60 years ago. From that point of view, “Cat on a Hot Tin Roof” is Paul Newman’s vehicle from opening to final scene. We first see Newman’s character of Brick intoxicated and poised to reclaim a lost glory from his high school days by jumping high hurdles in an empty athletic field at 3 o’clock in the morning. Against a backdrop of imagined cheers of onlookers long since gone, Brick clears two hurdles before crashing down onto the third one and breaking his ankle. Flash forward to Brick in pajamas on a sofa in a bedroom of his daddy’s majestic Mississippi mansion and nursing what we know to be yet another drink, a crutch straddled over his chest. The crutch comes later in the film to be symbolic of Brick’s other crutches – on alcohol, self-disgust over his inaction in football buddy Skipper’s suicide, on the walls he’s erected to keep wife Maggie the Cat at arm’s length and, above all, on his pain of being owned by Big Daddy instead of being loved as a son by a father. Enter wife Maggie, played flawlessly by a sultry and drop-dead gorgeous Elizabeth Taylor in what may well be her first bona fide role as a grown-up actress after a seemingly effortless transition to adulthood from child player and teenage ingenue. Brick and Maggie are at Big Daddy’s mansion with Brick’s older brother, “Brother Man” Gooper, and his wife, “Sister Woman” Mae, who are circling in to claim their share of the Pollick spoils while awaiting news if Big Daddy is dying. He is, and his legacy to his kin is an estate valued at nearly $10 million – $82.6 million in today’s currency – and some of the richest acres in the whole of Mississippi. As the drama unfolds, Brick is alternately at war with Maggie and Big Daddy – and himself as he hints at the nature of his relationship to Skipper, a classic Tennessee Williams hint of homosexuality. But Newman, in a superlative turn that earned him his first Oscar nomination in a respected acting career, plays Brick as a man mortally wounded by the loss of an intense emotional relationship with someone who also happens to be a man. As Big Daddy, Burl Ives brings a commanding screen presence to the role. Born before the start of the 20th century, Big Daddy is a product of his time, a man defined by the social dictate that a “real” man works and provides for his family and whose worth is measured more by his material acquisitions and less by his humane and emotional composition. In Big Daddy’s world – and in Brick’s to a lesser extent – men don’t cry and emotional vulnerability is a weakness. Facing his own mortality and his son’s emotional ruin, Big Daddy is caught between the dictates of manhood and masculinity and risking vulnerability by taking his son’s outstretched hand. In the end, the father takes what we hope is the wiser choice that will leave his son a legacy more enduring than blue stocks and bonds and strengthens Big Daddy’s acceptance of his imminent death. Then, in the closing scene before the credits role, we are left with the certainty that Brick and Maggie, alone and behind the locked door of their dimly lit bedroom, are going to give truth to her lie of a coming life. As bold as “Cat on a Hot Tin Roof” was as a film, it apparently was watered down significantly from its original Broadway production as a play. Newman reportedly was not fully satisfied with the movie treatment of Brick’s relationship with Skipper and pushed for a fuller – and more candid – exploration. Multidimensional and layered with multiple themes of manhood, family, sexuality, certain death and mendacity, “Cat on a Hot Tin” roof speaks to the definition of manhood almost 60 years after its release. Brick Pollitt risked being pegged as weak and less than a man when he ventured into territory that was unexplored at the time – the heart of a man. In the end, he did not sacrifice his identity as a man or his masculinity and gave men of his day and those from generations to come the strength to be emotionally vested in another man, to want to be loved, to feel pain – and to cry.